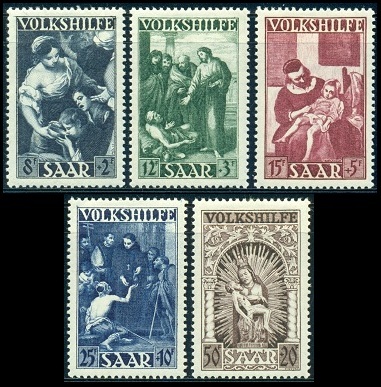 The Saarland commemorative stamp issues for 1949 are shown in the image above. The two stamps at the top (Mi. #262-63, Sc. #B65-66) were issued on January 11 to publicize Youth Hostels. The surtax was given to a fund for youth hostels. The two stamps depict Hikers at Ludweiler Hostel and Hikers approaching Weisskirchen Hostel. The stamp at the bottom left (Mi. #264, Sc. #203) was issued on April 1 to commemorate the 1st Anniversary of the establishment of the Saar University in Saarbrücken. The stamp design depicts a caudecus, microscope, Bunsen burner, and a book. The two stamps at the lower right (Mi. #265-66, Sc. #B67-68) were issued on September 25 to publicize the Day of the Horse. The stamp designs depict a mare with a foal and race horses. In 1949, the postal administration resumed its practice of issuing an annual set of charity stamps each Winter, featuring details of classical works-of-art. The five stamps shown in the image above (Mi. #267-71, Sc. #B69-73) were issued on December 20, with the surtax going to public charities. The five stamps feature: Detail from "Moses Striking the Rock" by Murillo (1617-1682), "Christ at the Pool of Bethesda" by Murillo, "The Sick Child" by Metsu (1629-1667), "St. Thomas of Villeneuve" by Murillo, and "The Madonna of Blieskastel" sculpture. The seventeen new definitive postage stamps shown in the images above (Mi. #272-88, Sc. #204-20) began appearing in December 1949, with additions continuing though June 1951. The themes of this new definitive series are portraits, industry, and landscapes. The legend on these new stamps has been changed to "SAAR" from the "SAARPOST" utilized for the previous definitive stamp series. 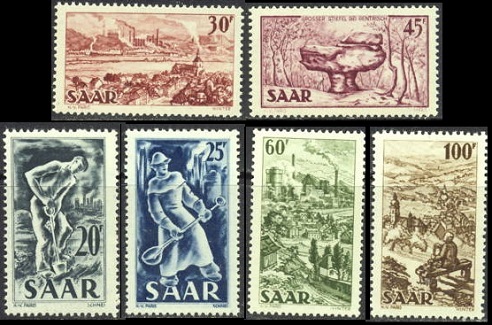 The 17 stamps feature 13 different designs, as follows (in their order of appearance): building trades, Ludwig von Beethoven, gears and factories, dumping mine waste, coal mine interior, communications symbols, emblem of printing, pottery, blast furnace worker, Saarbrücken, rock formation "Great Boot", Reden Colliery, and a view of Webelskirchen. 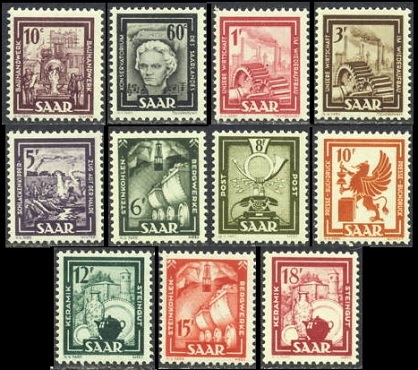 All of these stamps are available in gutter pairs, and the Saar University issue is available in gutter blocks.